I borrowed this book from a friend to review it. 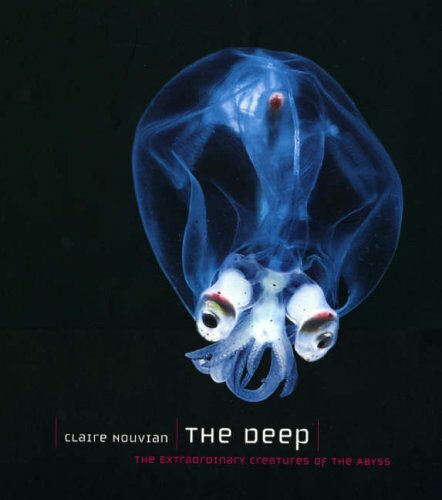 The Deep is a beautiful book that features photos of creatures living in the depths of the sea. It's fascinating to see the different lifeforms that are able to live in such unforgiving conditions. Some of the photographed subjects may look more at home in nightmares. The high resolution photos are a joy to look at. They are accompanied by informative text on the creatures, fish or whatever organisms they are. There are 5 CG rendered images included. In the first edition, they were only identified in the credits at the back of the book. Subsequent editions, like the one I have, have them clearly labeled just beside the picture. Those CG rendered images certainly look very out of place in a book like this that's filled with so many stunning real-life subjects. This could be a good reference for creature design.